The Banks Sidewinder Turbo for the 2005-2006 Jeep Wrangler improves low and mid-range torque, ideal for Everyday Driving, Rock Crawling and Trail Running. Torque output with the turbo at 1600 RPM is greater than the peak torque in stock condition. This aggressive torque profile is ideal for rock crawling and trail running scenarios. This standard system produces 6 PSI (pounds per square inch) of boost. The Ram-Air intake system is unique to the application and comes with an optional through the hood Super Scoop. Both versions of the system are designed with a slightly higher than stock entry point, leaving no compromise for water fording. The Super Scoop is modeled after the international version of the Jeep Liberty. 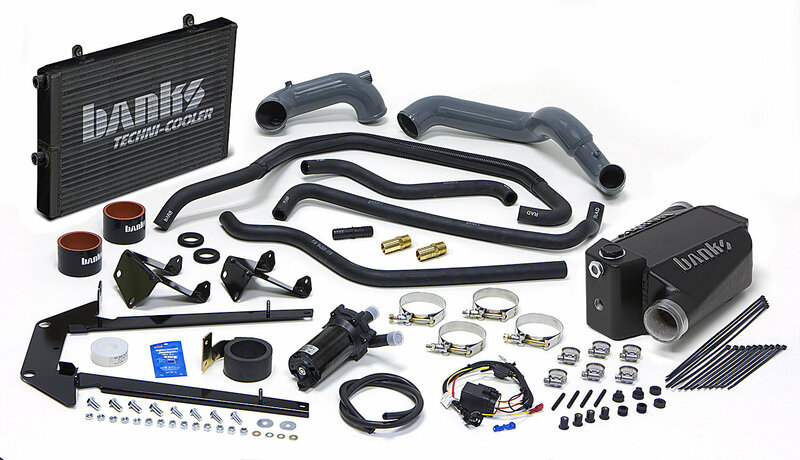 The turbo system is compatible with both the Banks TorqueTube header and the Banks Monster Exhaust. Double-slip joint for fitment to your existing exhaust tube.